Sold in pairs. Minimum order of 10 pairs. The wedding favor boxes are made of paper. 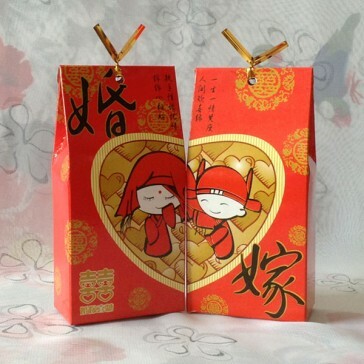 On the boxes are the bride and groom in traditional Chinese wedding dress. The favor boxes will be shipped to you flat. They have creased lines for easy folding. To assemble box just fold on creases, NO TAPE OR GLUE IS NEEDED. 3.0" X 1.7" X 1.1" (7.6cm X 4.3cm X 0.6cm).